The engraving above shows a busy scene at the Harbour. At the end of the Stone Pier is the Lighthouse of 1828 that was designed by William Edmunds. This replaced an earlier one that was erected when the Stone Pier, designed by the great architect and engineer John Rennie, was constructed between the years 1812-1815. Edmunds' Lighthouse survived until the Great Storm of February 1st 1953, when it collapsed into the sea after its foundations were undermined. The present concrete Lighthouse was completed in 1955. Serious problems were encountered during the construction of the Stone Pier due to the freshwater springs that bubble up in the area, relics of the Creek and Tivoli Brooks. These springs undermined a 100 yard stretch of the wall and the problem was overcome by spreading a bed of clay over the affected area and then laying a timber floor on it, after which the stone walls were built up on top. The Harbour Wall itself is constructed as a series of compartments filled with rubble and shingle and has now firmly withstood the fury of the sea for 186 years. 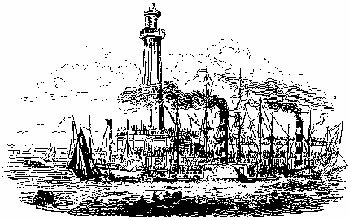 As may be seen in the engraving, the arrival and departure of vessels at the Harbour was always attended by vast crowds of sightseers. The central vessel in the scene is the "MAGNET" which was built at Limehouse for the Margate run in 1826. Her 150 horsepower engines were constructed by the steam pioneers Boulton and Watt and she was a popular vessel for 21 years until she was scrapped during 1847. Margate was once a busy commercial port with every kind of commodity brought into the town by sea. The Gasworks in King Street was a major user of coal, consumption had reached 50,000 tons per year by the time it was closed down in May, 1958, a victim of North Sea gas supplies.